A banknote (more commonly known as a bill in the United States and Canada) is a paper by which a bank promises to pay to the bearer on demand. Together with coins, banknotes make up the cash forms of all modern money. Coins are generally used for lower valued monetary units, and banknotes for higher values. Originally, the value of money was determined by the value of the material the money was made of, such as silver or gold. However, carrying around a lot of precious metal was cumbersome and often dangerous. As an alternative, banknotes would be issued. In financial terms, a note is a promise to pay someone money. Banknotes were originally a promise to give an amount of precious metal to anyone who presented the paper. People could pay for things by giving the banknote, and thus the stored value (usually in gold or silver coins kept in the bank's vault) that the banknote promised. In Europe the first paper money consisted of paper 'coins' issued in Protestant Leyden (today, Leiden) in the Netherlands during the Spanish siege of 1574. Over 5000 of the estimated 14,000 residents of Leyden died, mostly due to starvation. Even leather (often used to create emergency currency) was boiled and used to feed the people. So to create currency, the residents took covers and paper from hymnals and church missives and created paper planchets, which were struck using the same dies that were previously used to mint coins. 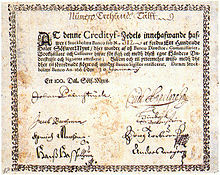 The first proper European banknotes were issued by Stockholms Banco, a predecessor of the Bank of Sweden, in 1660, although the bank ran out of coins to redeem its notes in 1664 and ceased operating in that year. 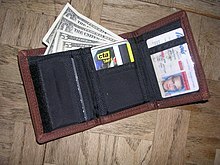 Banknotes are often kept in wallets. Emergency paper money hand-written on playing cards was used in French Canada from 1685. 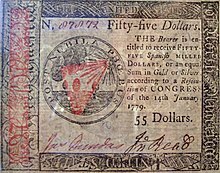 In the early 1690s, the Massachusetts Bay Colony was the first of the colonies to issue the permanently circulating banknotes. 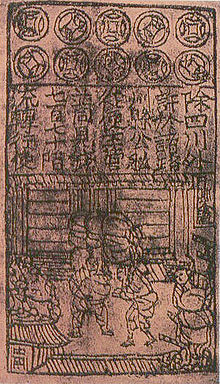 The use of fixed denominations and printed banknotes came into use in the 18th century. In the United States, public acceptance of banknotes in replacement of precious metals was hastened in part by Executive Order 6102. This order carried the threat of a maximum $10,000 fine and a maximum of ten years in prison for anyone who kept more than $100 of gold in preference to bank notes. Similar measures were taken worldwide, with similar results. The Simple English Wiktionary has a definition for: banknote. This page was last changed on 11 November 2017, at 03:52.